Denier Weirdness: WUWT sez it's anomalously cold in the sky! What David's done today, or at least what he claims to have done, is compare three global surface temperature data sets with two satellite lower troposphere data sets. He's differenced some numbers, and it's not clear to me if he even knows what his different data series are each measuring. The other odd thing is that he refers to all the data sets as GSTA's. That is, as global surface temperature anomalies. Yet the two satellite sets of data that he uses for comparison are for the lower troposphere, which is an average of the air temperature over a vertical distance above the land and sea surface. I then simply subtracted the UAH monthly GSTA from the corresponding monthly GSTA of the other data sets (in this case, GISS, Hadcrut 4, RSS and NCDC; Data from January 1979 through March 2014). I then plotted these differences for each corresponding month and performed linear regression through each set of differences (Figure 1). A value of 0 means that the UAH data and the other dataset are similar, a value >0 means the other dataset reports a higher monthly GSTA compared to UAH and vice versa. As you can see, the three land-based data sets consistently report monthly GSTA higher than that of UAH. Of course they do. 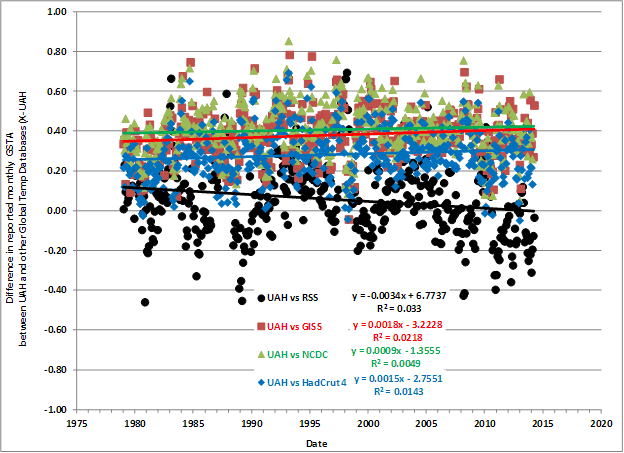 UAH is an anomaly from the 1981 to 2010 mean. 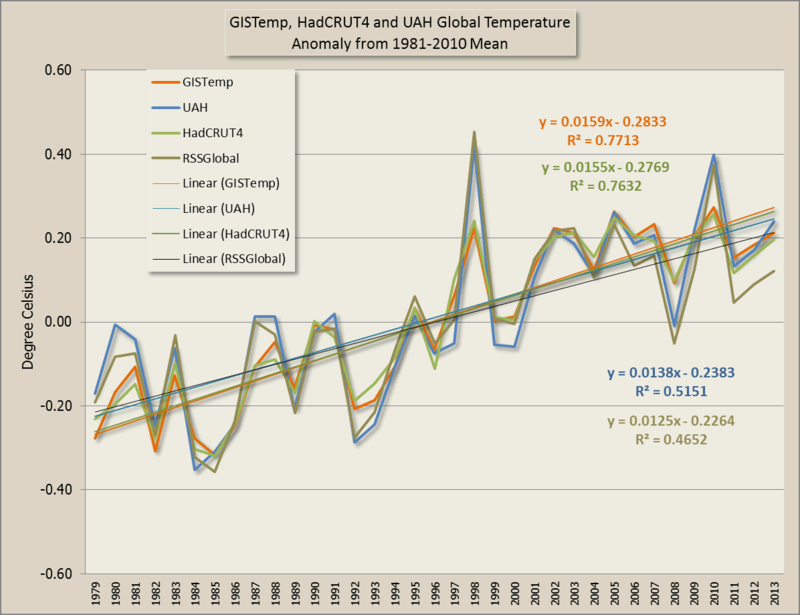 GISTemp is an anomaly from the 1951 to 1980 mean and HadCRUT is an anomaly from the 1961 to 1990 mean. So of course the anomaly is going to be greater for data sets with an earlier baseline. The other satellite based data-set, RSS, reports values rather similar to UAH (average difference of 0.058°C). It should be different. UAH anomaly is from the 1981 to 2010 mean whereas RSS anomaly is from the 1979 to 1998 mean, so the RSS anomalies should have been higher than the UAH anomalies. In summary, all five GSTA datasets analyzed here show an average GSTA over the past 35 years of between 0.01 to 0.42°C above their respective baseline period that varies between each data set. The land-based data sets report in all most all cases monthly GSTA that are higher than the satellite based GSTAs. In addition, there is a general trend towards larger differences between the former and later data-sets over time (since 1979). The GISS data-set has the strongest trend in difference over time and will soon report the largest difference with UAH if this trend continuous, as well as diverge more from the other land-based data-sets. The continuing divergence to the point where the difference is larger than the long term averages between satellite-based and land-based reported GSTAs warrants more in-depth analyses and attention. As you probably know, there's not a great deal of difference between the two surface data series. GISTemp has a slope of 0.0159 and HadCRUT a slope of 0.155. UAH and RSS are pretty close except for the last couple of years, where RSS is lower than everything else. UAH on the other hand starts off higher than anything else. Also, RSS only goes from 70s to 82.5N, whereas UAH supposedly covers more area. (I can't remember where UAH starts and stops - can someone remind me?) However I'd expect that the UAH team have to deal with the problem that prompts RSS to leave out Antarctica - that the mountains get in the way and muck up the readings. Because of the different base periods for anomalies, maybe the comparisons are not as useful as they might be. Can you get hold of the base period data for all series, then re-construct the absolute temperature series for all except UAH (say) and re-base them on UAH’s base period. The results could be a bit different. If you can’t get hold of the base period data, then you can rebase them all to a common period (eg. 1979-1989), provided you then report annual averages not monthly data. Given that your main findings are expressed in deg p.a., the results will I think be equally valid. The graphs might also be easier to interpret. As Mike Jonas says, this is meaningless unless you put them on the same anomaly base. The trend differences are meaningful, but the only one that stands out is the difference between UAH and RSS. UAH and the surface measures are relatively close. It is Lord M’s favourite, RSS, that is the outlier. Theer is an interactive graph here of those five indices, plotted monthly on a common base. 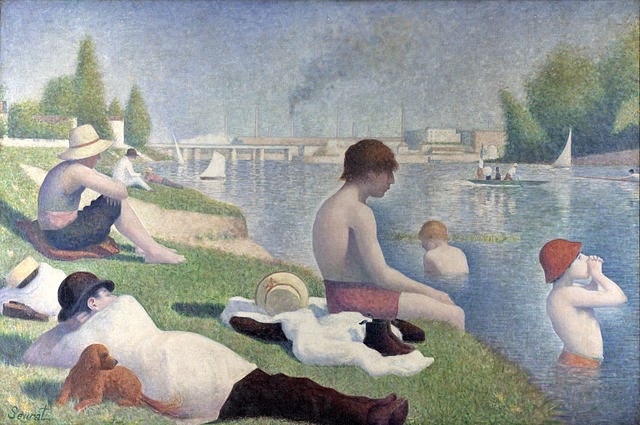 It is interactive – you can rescale etc. Scroll up for details. Is thegriss being sarcastic or serious? Its good to know that 1 out of 4 is close to reality. Gavin and Phil will continue to try in vain to CREATE a positive trend as the temperatures start to drop slightly over the next several years. When temperatures don't drop slightly over the next several years thegriss will presumably accuse Gavin and Phil of creating an El Nino. Or the appearance of one, at least. UAH and RSS tend to exaggerate ENSO influences; it'll be interesting to see how the Denialati handle that over the "next several years".